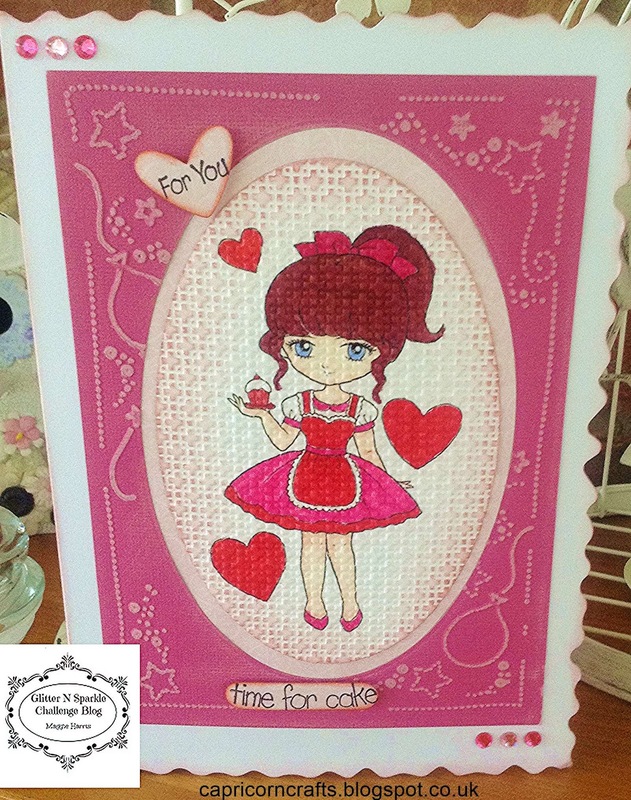 Today I am sharing my DT card for the new challenge which starts today at Glitter N Sparkle Hope you can join in for Challenge 173 Embossing - Dry or Heat. I have coloured this gorgeous image with promarkers before cutting with an oval die and then embossing with a sizzix folder - I have to confess this step was a - what if moment - but I loved the texture achieved on the image which really made her pop, the edges were inked with victorian velvet distress ink to achieve another layer and show u the texture. Next an oval aperture was cut from a piece of pink ColourCore card which was then embossed and the design was sanded back, a layer of pink patterned paper was added behind the aperture before adding my image. 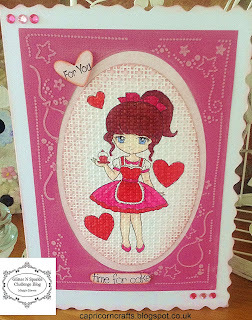 Edges of the card base were also inked with Victorian velvet, lastly pink gems were added. Beautiful card, I love the embossing it looks great. Really zingy colouring, and like you I love the texture on the image - very cool. Adorable!!!! Thanks so much for participating in our LEMON SHORTBREAD challenge!!! Can’t wait to see you participate again in our next challenge! !